You may have noticed there’s been a lot of construction going on at Navy Pier recently. Or you didn’t, since you, uh, never go to Navy Pier. With the Midwest's #1 tourist trap undergoing $115 million worth of "re-imagining", maybe, just maybe it could be re-imagined as a place that the locals would want to visit more than never. 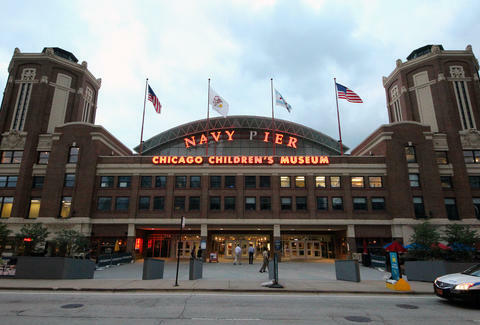 Here are eight fixes Navy Pier should make, aside from replacing the "P" lightbulb on its sign (what is this, a strip mall?). 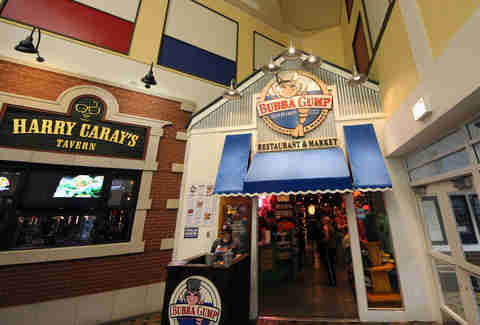 Having a Bubba Gump Shrimp Co. show up in your food court is like having a strange lump show up on your body -- it needs to be removed. Couple that with the facts that they don't have a single credible Chicago-style pizza or hot dog joint, and the only thing that comes close -- America's Dog -- was voted the #1 hot dog in Chicago by Food Industry News in 2009 by someone who clearly has never eaten at any of these 25 superior hot dog spots. You'd never recognize the pier as the former site of Chicagofest, where Joan Jett played in her prime. This past summer's music lineup -- including names like Stache!, 97Nine, Train Company, One Hot Mess, and Libido Funk Circus -- makes Cubby Bear look like the House of Blues by comparison. For comedy, charging people $25 to see morning show news anchors doing standup sets, in a city packed with talented full-time comics, is just wrong. And we're not even going to talk about Cirque Shanghai. If we wanted a hot pretzel, hair weave, and a bedazzled cell phone case, we’d go to a mall, not a historic landmark. We understand souvenir shops are a necessary evil ($20 for a Ferris Bueller’s Day Off DVD? Seriously? 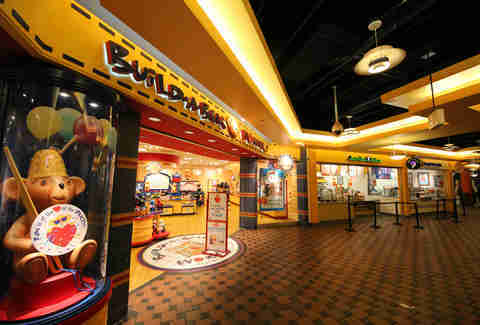 ), but 20+ years of catering ONLY to tourists has sent the pier down a bad path lined with overpriced fast food chains. 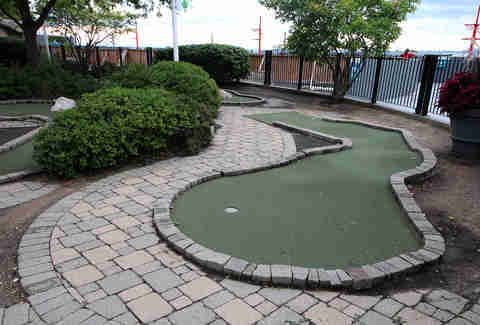 A mini golf course without so much as a windmill is as boring as real golf. It just looks sad. 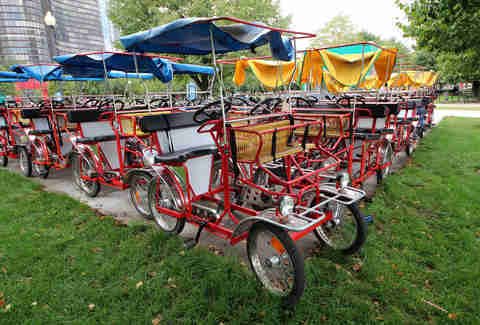 These hokey four-person bikes might be good in peaceful, less populated nooks of the US, but not so much on the Lakeshore Path when it's overflowing with bikes and beach-goers. Just stick families of four into a virtual reality box for a half hour and keep them from becoming red asphalt. Being fully commercialized has meant scrubbing away a sense of history -- this pier could exist anywhere in the country. You won't get a feel for the pier's 1920s boom when it had its own streetcar line (also its own jail for draft dodgers), or when it was a naval base or university. 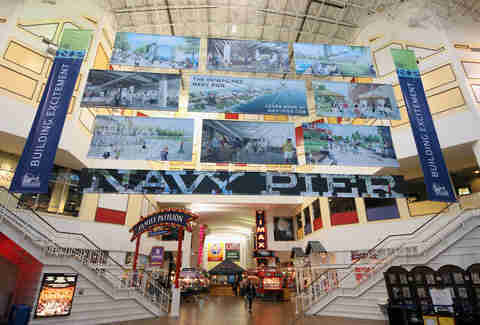 It'd be nice to see exhibits or artifacts related to it having actually been a, uh, navy pier. 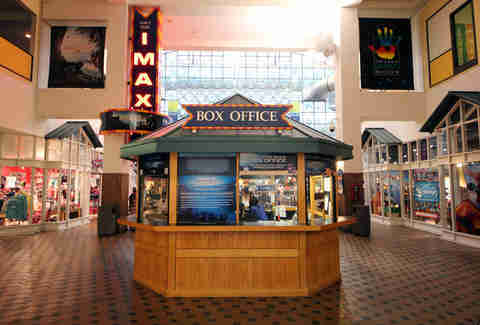 For that one big blockbuster of the year that needs to be seen on a giant disorienting contact lens, it's bad enough that you're shelling out $20 for parking and $20 a ticket, but having to get in a line backed up to the bathrooms because of a lone box office worker is just plain dumb. Fireworks, Chicago Shakespeare Theater, booze cruises -- all things that should stay a part of the pier. 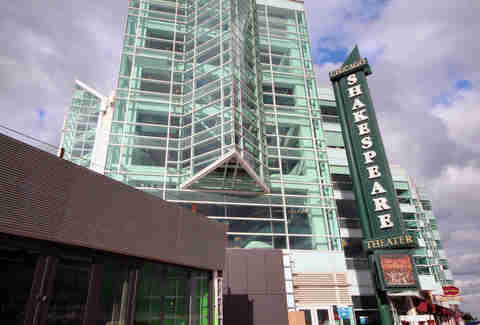 Fine, the stained glass museum, too. 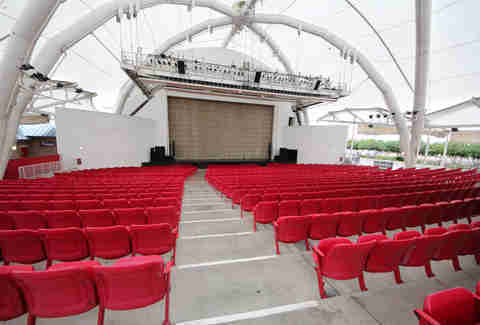 What changes would you make to Navy Pier? Drop us a line in the comments. Sean Cooley is Thrillist's Chicago Editor and he has plotted his zombie attack survival route to Rice Lake State Conservation Area. Follow him @SeanCooley.